Metal dome membrane switches will deliver high reliability and a “snappy” response. ALMAX offers a wide range of metal dome membrane switches to meet your actuation requirements. 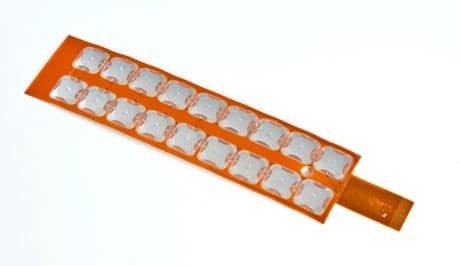 A metal dome membrane switch is comprised of metal dome contacts mounted to printed conductors. Metal dome membrane switch arrays can be adhered to a variety of substrates including copper flex, silver flex or rigid printed circuit boards. The electronic module is then encased inside a membrane switch assembly. ALMAX Electronic Interface Solution’s manufacturing capability includes the printed circuit boards, both rigid and flex, metal dome contact assemblies and membrane switch graphic overlays. ALMAX is a true single-source supplier for your custom metal dome membrane switch. Additionally, ALMAX can provide the electronic sub-components, or circuit pack, for your metal dome membrane switch. Many of our customers are nameplate manufacturers, re-sellers and other partners found within your electronics supply-chain. To activate a metal dome membrane switch, the metal dome is compressed to the substrate conductor which provides a “snap” or tactile response for the user. The tactile response coincides very closely with the moment of contact. On a metal dome membrane switch, the activation force is determined by the construction of the metal dome. Metal dome membrane switches allow you to design the activation force suitable for your application simply by selecting the appropriate metal dome. To feel the available range of activation forces, request your free metal dome membrane switch sample packet. Metal dome membrane switch are suitable for high-use environments. The metal dome contact assembly is capable of reliability delivering a 1,000,000 or more switch actuations. Metal dome membrane switches are also suitable for harsh environments. The membrane switch assembly is fully enclosed and moisture resistant. The metal dome switch construction is light weight and can be thin, making them a suitable membrane switch choice for tight tolerance form-factors. Metal dome membrane switches are also cost-effective to shield making them an excellent choice for EMI/RFI or static sensitive applications. Unsure if a metal dome membrane switch is correct for your application? Contact our engineering team for a custom membrane switch design review.